MWC 2018: The question is, will it launch outside of China? Cables. That is the number one thing I hate most about the first generation of proper VR headsets. It's always in the back of my head that I'm going to twist myself up in them or worse, trip over them. In 2018 though, the cables are out. Facebook has the Oculus Go that stands alone without wires and now the Vive Pro is able to ditch the cables too. HTC is also venturing into the world of standalone VR with the Vive Focus. The company's first standalone headset was unveiled in late 2017, but is currently only available to buy if you happen to live in China. There's no news just yet when or if the rest of the world will get a play with it too, but HTC is now prepared to show it off to the rest of the world including out at Mobile World Congress in Barcelona. Before I get into what it's like to use, let's break down the key Vive Focus details. The headset, which is available in either blue or a pretty slick looking white version is not powered by a smartphone. That computing power is down to Qualcomm's Snapdragon 845 processor with no need to be connected to a computer. 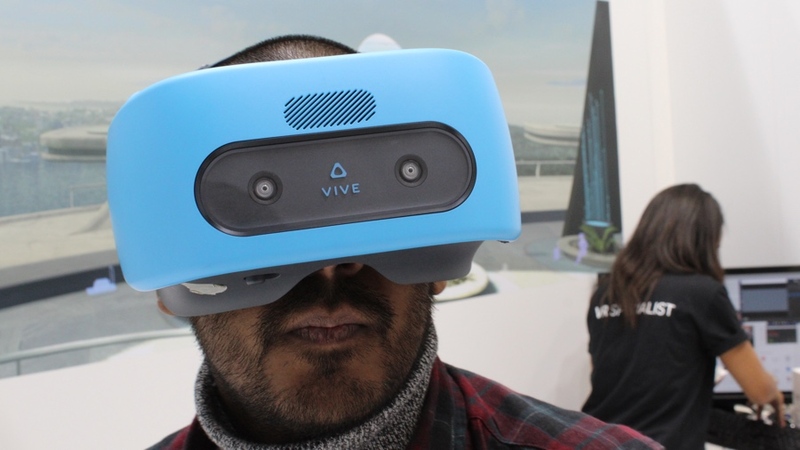 It offers a 75Hz refresh rate (which is less than the Vive) but uses the same lenses and 1,600 x 1,440 OLED display as the Vive Pro headset serving up a maximum resolution of 1,600 x 2,880. It makes room for a micro SD card slot, a built-in battery, integrated speakers and wireless connectivity support too. What's really big here is that it offers six-degrees-of-freedom (6DoF) tracking. That means you can move in VR a bit like you can with the Vive or Vive Pro but without the need to have any of those basestations dotted around the room. This my friends, really is the future of VR. So what is the Vive Focus like to use? I was able to sample a couple of short demos to get a feel of what to expect. To look at, the Focus looks bulky and heavy but that's far from the case when you put it on. It's surprisingly light and there's a twisting wheel at the back to adjust the tightness of the fit so it doesn't slip or move around. Thee's also a sliding switching inside of the headset to adjust the lenses to get the perfect immersive experience. First up was a short 360-degree 8K resolution video of Time Square jam packed with tourists. The image quality is pretty crisp and in no way laggy, despite essentially being powered by a processor that's primarily found inside smartphones. Put it side by side with a high end headset and image quality is not in the same league, but it's still very impressive. After the video it's time for some gaming. I'm passed a controller that feels a lot like the one bundled with Google's Daydream View headset. There's two buttons on top, alongside a touchpad button and a trigger where your fingers sit around it. Unlike the headset, the controller only offers 3DoF tracking, which means the range of movement that can be tracked is smaller in comparison to the headset. The game I get to play is called Mercenary, a pretty simple looking shooter where I can point the controller and hit the trigger to take out the bad guys. But I can also move in the environment, crouch behind crates to hide and stand behind walls. While the game is definitely on the basic side, the execution of the tracking and the freedom to move works largely very well. But I did feel a slight disconnect with the difference in the range of tracking offered by the controller and the headset. Shooting with the controller didn't quite feel up to speed with what was happening in the environment. Like the Vive, you'll know when you've stepped out of that tracking zone pretty quickly and I think it only happened on one occasion. Sound quality from the built-in speakers struggled to block out the noise from a noisy showroom floor, but if you are in the comfort of your own home it's likely to do a better job of that. There's also a headphone jack as well if you want to plug in your own 'phones too. After I fail to entirely conceal myself behind a bunch of crates, my game time is over, but I'm definitely eager to play some more. Will we see the Vive Focus outside of China? Based on my short time with it, I really hope it does. Maybe it'll be under a different name and come packing Qualcomm's new Snapdragon 845 processor that the chipset company has been showing off in its own reference VR headset. The demos I tried were perhaps not the greatest showcase of what it could offer casual VR fans who would like to step up from smartphone-based headsets like Cardboard. A lot will come down to pricing and getting developers on board to build for the Vive Focus through the Vive Wave development platform. Paul Brown, general manager of Vive Europe, tells me that since its China-only launch there has been an appetite from developers to create experiences for the Focus. There's still no indication whether it will get a global launch as HTC continues to use China as a testbed to determine if a further rollout is the something it should do. HTC needs to strike a good balance in terms of pricing and ensuring that devs want to build for it and take full advantage of the features on show with the Vive Focus. Then there will be a much stronger argument to let more people get their hands on HTC's impressive first standalone VR headset.